This version was compiled in osx Sierra, should be compatible with previous osx versions, hopefully, but it was not tested. It's still a 32 bit binary anyway. You will need the frameworks to go with it, just install them in your /Library/Frameworks directory. Version notes : sdl_sound seems to use the native osx library for mp3s which makes it much more convenient. I couldn't test any accelerated opengl display, but opengl seems to work. I have included m68kdis and dz80 in the bundle to be able to disassemble using the console (since it seems harder to place a new binary in the default path with recent osx versions it's easier to include it here now... ! the binaries are small anyway). 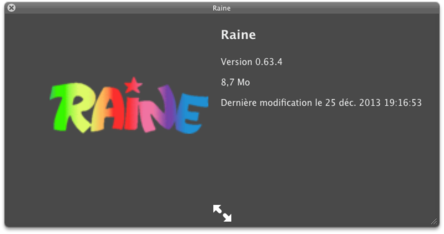 Raine 0.63.4, mac os x intel version, click on the picture to download (compressed with 7z, it's highly advised to use ez7z on mac, apparently the only solution which had the decency to keep 7z free on macs. It supports opengl, but opengl was a little disappointing on my hardware, be sure to choose "Texture" for the renderer in OpenGL "Renderer's options", because the Drawpixel method seems surprisingly slow in osx. Also all the shaders didn't work on my hardware, maybe you'll have more luck here too. I couldn't get any hardware accelerated overlays, maybe you'll be more lucky with your hardware, otherwise just avoid overlays (in video options). Since overlays had some issues in the previous version, it shouldn't be a big problem. The 1st time you run it, it will choose a windowed mode with normal blits. Yuv overlays are disabled by default contrary to the windows and linux version because there are some oddities in osx with overlays. It might work well on your system though (it probably varies a lot depending on the graphics card and the driver installed), to try them go to video options, and choose "Autodetect : hw yuv overlays / normal blits" as the video renderer. October 2010 : you can now turn off the osx specific overlays workarounds, since I suspect they are not needed everywhere. These workarounds are on by default. Go to video options to disable them. On my system when disabling them I get a black screen when in fullscreen, and the gui menu is covered by the game screen when returning from a game in a windowed mode, so be careful. Picture uncentered in fullscreen with a white border on the right side. When going back to the gui in windowed mode, sometimes the menu is hidden by the game picture ! 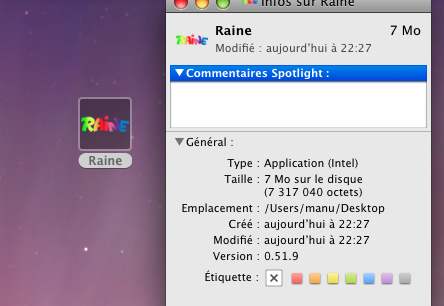 I found that resizing the window in this case makes the menu to appear. There was a weird brightness to the picture, it looked like a picture from an old video (interesting video effect, but unwanted !). So test carefully, it shouldn't crash anyway. Also if you want to add game screenshots or bezels (see the extra section for that), place them in your ~/.raine directory, subdirectories screens and artwork. This directory is hidden in the finder by default, use either the terminal and type "cd ~/.raine" in the terminal after having run raine at least once, or use a tool like TinkerTool to access it (directory .raine from your home). This is all I can think of for now, report on the forum if you try this :) !